No that's not an alien! This is an elongated skull from South America. It comes from the western coast of Peru. Recent DNA research conducted by the Lakehead University lab in Canada, as well as two other labs in the United States, have shown that these elongated skulls have the Haplogroups (genetic population group) U2e1, J1B1, and H1 of which is found most frequently in Eastern Europe, and at a low frequency in Western Europe. The bone powder from the most elongated skull tested came back as T2B, which originates in Mesopotamia and what is now Syria, essentially the heart of the fertile crescent. (1) What was surprising is that the DNA results showed that these people had very little DNA from Haplogroup A and none from the Haplogroups B,C,and D, which are the Haplogroups of all North American and South American Indigenous peoples. If these results are correct, it places the original people of these elgonated skulls into regions of the world where neanderthals had existed, and thus helps support the theory that what we are looking at in the elongated skulls of Peru are not aliens or another speices of hominoid, but are in fact a genetic remnant of one of the earlist cross speices mateing occurances in our ancient past between homospaiens and neanderthals. In order to validate this claim it will be shown that the increase in Neanderthal DNA in modern humans directly correlates to an increase in crainal size, occification of the saginal sutter, an increase in the size of the ocipatial bun, and a relocation of the magnus foram, traits that are found within the elgongated skulls of Peru. "This introduction of Neanderthal alleles most likely occurred in Eurasia, as modern humans ventured out of Africa, between 47,000 and 65,000 years ago7 and accounts for about 2% of the entire non-African human genome"
Recently DNA research has been done on a large sample of elongated skulls. This study was sanctioned by the Peruvian government and was conducted by the university of _________ as well as another institute in the USA. The results are astonishing to say the least. If correct the DNA haplo groups found put the origins of these South American skulls somewhere in Turkey, and the results have these people migrating up between the Caspian and Black Sea, into Northern Scandinavian countries and into Western Europe. The DNA results show that these people had very little DNA from the A haplo group and none from the haplo groups B,C,D, which are all North American and South American Indigenous peoples DNA haplo groups. This means that at some point between 1000 and 3000 BCE a group of these people with elongated skulls set sail somewhere in Northern Europe, traveled very far, and landed on the western coast of South America. So if these skulls are not alien then how in the world did that persons head end up like that? Many in the scientific community ascribe the elongation of these skulls to cradle boarding. Though this might have occurred, it fails miserably to explain a number of genetic mutations that seem to occur to a number of these elongated skulls. The absence or occification of the saginal sutture. The Foramen Magnus, the opening in the bottom of the skull where the spine connects, is an average of 3 cm behind that of a non-elongated skull. How are these mutations even possible? Unless these skulls are specimens of homo sapiens that exhibit features of another hominoid spieces that humans had matted with in the distant past, and since the elongated skulls originate from turkey, a location neanderthals held for a lengthy period of time, could these "mutations" actually be more neanderthal traghts in regards to the cranium of the skull. Is this even possible? Interestingly, most humans on Earth have Neanderthal DNA in there body, anywhere from 1-3%. This means that at least one union between a Neanderthal and Homo sapian must have occurred. What is also interesting is that according to the research conducted by Gregory MD, Kippenhan JS, Eisenberg DP, Kohn PD, Dickinson D, Mattay VS, Chen Q, Weinberger DR, Saad ZS, Berman KF. in the paper titled, "Neanderthal-Derived Genetic Variation Shapes Modern Human Cranium and Brain," it concludes,"that the amount of Neanderthal-originating polymorphism carried in living humans is related to cranial and brain morphology. The more neanderthal DNA a homo sapian has the more likely they will exhibit neanderthal cranial features such an increase in cranial cc." So if 3% neanderthal DNA can elongate a modern homo sapian skull, what would 50% neanderthal DNA do to the cranium? One could postulate that it would resemble that of a neanderthal cranium. 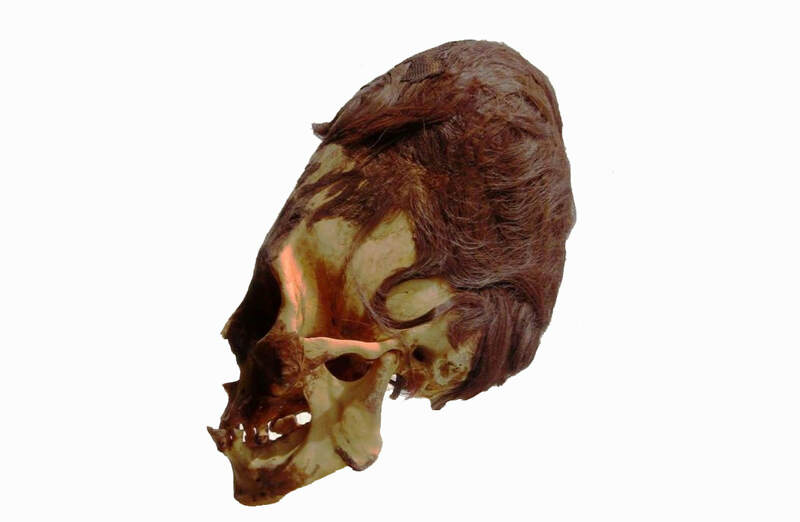 Do the elongated skulls exhibit the major features of the neanderthal cranium? Lets have a look. As a global society we have only a few speciums of actual neanderthal skulls. Some only pieces. However, from this data a comprehensive reconstruction of a neanderthals skull has been created. As seen below. From extensive study _____________ has concluded that, " quote about saginal suture ossifying shortly after birth" This means that the Saginal suture on a fully developed neanderthal skull would be difficult, if not next to impossible to see. As mentioned before, some of the elongated skulls of Peru do not exhibit a saginal suture. The lack of a saginal suture on both the neanderthal and the elongated skull conferm the similarity in this specific feature. It seems that for neanderthals, the foramen magnus is _______cm behind the ear canal. Modern humans have the top part of the foramen magnus sit in line with the ear canal. Does this mean that when we are looking at the elongated skulls of Bolivia, we are in fact looking at a people who were able to retain more of the genetic feature of a line of people who were able to retain many of the neanderthal traits had been able to do they line up with the features that are found on a Neanderthal cranium? Do neanderthal and elongated skulls have the same Craium cc. First, as a validation of our approach, we demonstrate that a greater load of Neanderthal-derived genetic variants (higher "NeanderScore") is associated with skull shapes resembling those of known Neanderthal cranial remains, particularly in occipital and parietal bones. Next, we demonstrate convergent NeanderScore-related findings in the brain (measured by gray- and white-matter volume, sulcal depth, and gyrification index) that localize to the visual cortex and intraparietal sulcus. that the more neanderthal DNA a homo sapian has the more likely they will exhibit neanderthal cranial features such an increase in cranial cc. the first and most important criteria has been meet. That is when a homo spaian has more Neanderthal DNA in their genome they seem to exhibit more cranial features of a neanderthal.